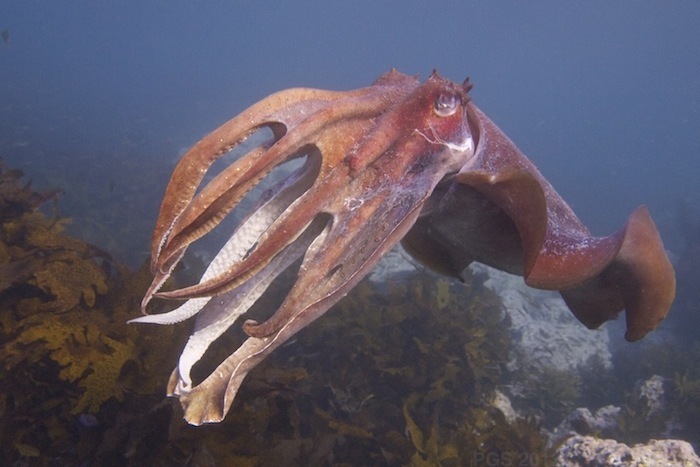 The papers below are mostly about cephalopods, the group of animals that includes octopuses, cuttlefish, and squid. My blog discusses these animals and other underwater topics as well. • “Octopus Engineering, Intentional and Inadvertent,” (D. Scheel, P. Godfrey-Smith, S. Chancellor, M. Hing, S. Linquist, M. Lawrence), Communicative & Integrative Biology, e1395994 (2017). • “Against Octopus Farming,” Issues in Science and Technology 35 (2), Winter 2019 (J. Jacquet, B. Franks, P. Godfrey-Smith, W. Sánchez-Suárez). With art by Judy Fox. • “Did They Mean To Do That? 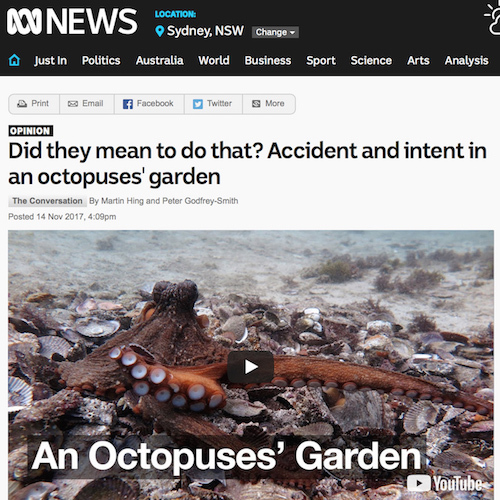 Accident and Intent in an Octopuses’ Garden” (M. Hing and P. Godfrey-Smith), The Conversation, November 14, 2017. Reprinted by ABC News (Australia). • “Signal Use by Octopuses in Agonistic Interactions” (D. Scheel, P. Godfrey-Smith, M. Lawrence) Current Biology 26 (2016): 1-6. • Cephalopods and the Evolution of the Mind. 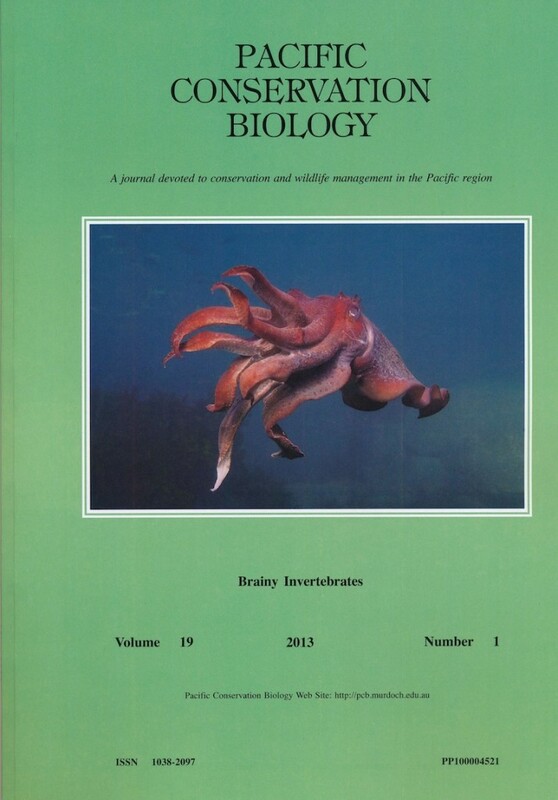 In Pacific Conservation Biology, 2013. • Long-Term High-Density Occupation of a Site by Octopus tetricus, with Possible Site Modification Due to Foraging Behavior (P. Godfrey-Smith and M. Lawrence). Marine and Freshwater Behavior and Physiology, 2012. Observations of a site in Australia. For an update about the site, see here. • “Octopus tetricus as an Ecosystem Engineer,” (D. Scheel, P. Godfrey-Smith, and M. Lawrence), in Scientia Marina. A second paper about the Octopolis site. 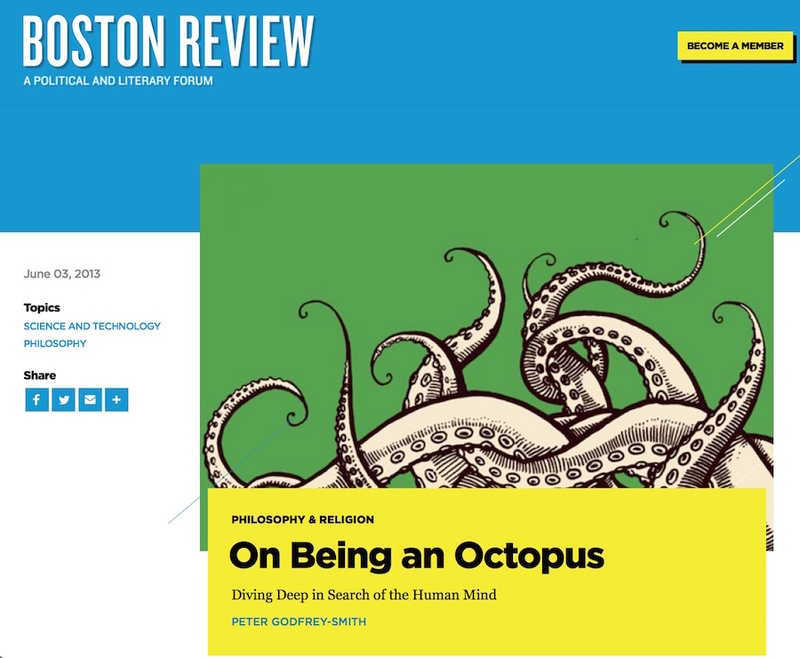 • On Being an Octopus. 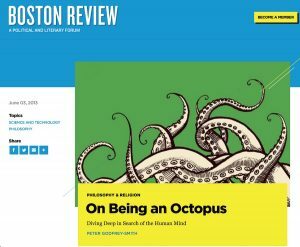 Boston Review, 2013. What might it be like to be one of these animals? A Nautilus interview on the same themes is here. • A book review of Cephalopod Cognition (edited by Darmaillacq, Dickel, & Mather) in Animal Behavior, 2015. • A new paper about the evolution of communication, with some underwater content. • Field Observations of Mating in Octopus tetricus and Amphioctopus marginatus, with Christine Huffard, Molluscan Research, 2010.